The Hoyo de Monterrey Epicure No.1 is a smooth Habano, a rich Corona Gorda, 5.6” (143mm) long, of 46 ring gauge, and comes in a 25 cigars box. It is a cigar of the next to perfect construction; the wrapper is smooth and slightly oily. It is smoking beautifully and the draw on this cigar is flawless. On top of that, the flavor profile of this stogie is incredible. Definitely a must-try for all the fans of Corona Gorda vitolas. There are flavors of wood, earth, hay and nuts. There is also lots of creamy espresso, and some mineral notes. It might not be the most complex cigar, but it nevertheless won’t let you indifferent. Some delicate touches of pepper also spice up the Epicure No.1, whereas in terms of strength, it never goes over a medium body. 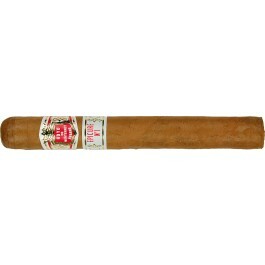 Very similar to a Partagas or a Romeo y Julieta in term of appearance and flavor profile. It also has a great potential for ageing. The Hoyo Epicure No.1 is an amazing cigar that brings lots of complexity of flavors while not being too strong. • Very complex cigar, with lots of wood, earth, hay and nuts. • There are also lots of creamy coffee flavors, and some more sweet notes to it. The construction on this cigar is simply amazing; it smokes perfectly until the nub. The cigar has a beautiful appearance, the wrapper is very well rolled, and no veins are visible. The cigar has a velvety feeling to the touch, thanks to a slight oily sheen. There is a nice triple cap. The squeeze test reveals a medium firm cigar. The wrapper smells of leather and hay. There is also some earthy tones in the foot very typical of Cuban cigars. The pre-light draw gives a pleasant mix of cedar, hay and herbal tea. Once cut, the draw is as close to perfect. The lighting of the cigar is easy and the burn is neat from the get-go. The ash holds on firmly. The first third of the cigar greets you with some Partagas like flavors, lots of hay, cedar, earth and nuts on the draw. Some leather also comes in the forefront. Alongside, there are some creamy notes of cocoa and semi-sweet tea. There are also some hints of nut fruits and a slight zing of spice on the finish that is creeping up all through the first third. Overall, the first third is in the light to medium range in terms of strength. The draw remains amazing and smooth, the ashes builds up as a nice charcoal and a good amount of smoke is released. In the middle third, the Epicure No.1 reveals its true self, a great complexity of flavors reaches the palate. On the draw, the cedar, leather and cocoa are still the dominant flavors, but the pepper steps up. In addition to these, the herbal tea increases in strength, and gives some dryness to the cigar. There are also some mineral and some charred flavors that joined the mix, especially on the retrohale. There are also notes of citrus, grain and spices (white pepper and clove). Overall, the middle of the cigar is now well in the medium range. The burn line is somewhat erratic in the middle third, but the magnificent flavor profile is making it up for that. In the final third, the flavor profile remains similar with still lots of tobacco, leather, cedar and earth. The main difference is in the spice, the twang goes up a notch, both on the draw and on the finish. The coffee flavors are joined by sour fruit notes; the balance of flavors is just amazing. Towards the very end, the cream is more present, and also some notes of nuts and hay. Overall, the cigar strength remains a strong medium until the end. The burn line is sharp all throughout the cigar and the draw remains great and never too hot. In summary, it is a cigar that proves to be more than what one could expect. It is advise to have some experience with Cuban cigars prior to smoke the Epicure No.1 in order to appreciate it for its true self and to be able to compare to other Habanos.